Brough Carpets knows that flooring manufacturers and retailers always recommend professional installation because most inexperienced installers and do-it-yourselfers won’t achieve the results that these fine materials deserve. That’s the case because no two flooring products require the same installation methods recommended by their manufacturers. In fact, many manufacturers will not even honor the product warranties they provide unless their installation has been completed by professional installers. When deciding to use the least costly installation, or the do it yourself to save money, it generally ends up costing more in the long run. We have often been called upon to repair the many mistakes made by inexperienced installers. Since brand new flooring is a major investment for most homeowners, it’s just not worth the risk of inexperienced installation that increases your total project cost and lengthens the time to its completion. ● Improper measurements – Unless the floor area you are measuring is in a room that is perfectly rectangular or square, making accurate measurements isn’t as simple as you may believe. For example, it’s quite easy to forget to measure the area inside closets or other adjacent locations that should also receive the new flooring. 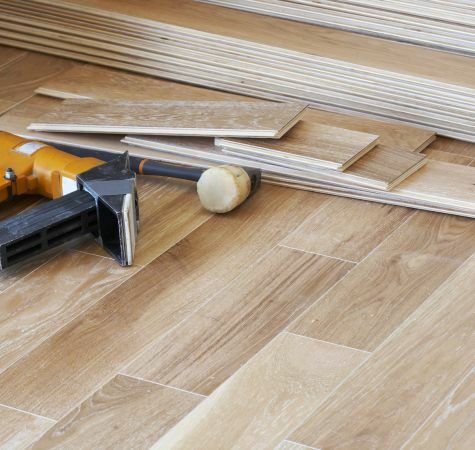 This error alone easily results in ordering an incorrect quantity of flooring materials which can mean extra time to complete your installation. ● Failure to acclimatize products before installation - Many flooring materials must be permitted to sit in the area where they will be installed in order to become acclimated to the environment in that area. This is particularly important with hardwoods. If this acclimatization is not performed, especially in climates that have high-humidity, the flooring may later absorb moisture and swell up to create ‘bumps’ that affect the looks of the floor and possibly create tripping hazards as well. Unless you have a considerable amount of prior on-site installation experience, having a professional install your floors will prevent mistakes, save money, eliminate delays and do away with any unnecessary stress. Problems can occur due to humidity, incorrect installation techniques, or failing to use the proper pad under carpeting. Brough Carpets offers a wide selection of flooring materials and professional installation to homeowners in Flint, Lapeer, Grand Lake, Columbiaville, Davison, North Branch, Imlay City, Attica and other nearby Michigan areas from our two locations in Lapeer and Flint. Every member of our installation team is both State licensed and insured for our customer’s protection. We will be happy to tell you much more. Phone us, e-mail us or stop in at one of our showrooms when it is convenient to discuss your interest in professional flooring installation with one of our experienced flooring specialists.